Recently, Xiaomi promised to provide the first stable build of its MIUI 9 before August 15. So, MIUI 9 Beta build is expected to release alongside the launch of Mi 5X on July 26. 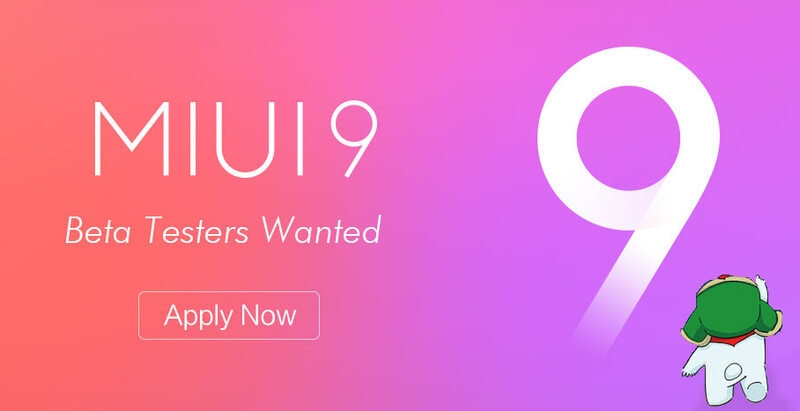 The new MIUI 9 is developed based on Android 7.0 Nougat. It is anticipated to come with a redesigned lockscreen, an always-on VPN, a new launcher, and themes. It also features Split screen multitasking, improved doze mode and other features from stock Android. Recently, Xiaomi has announced an extensive list of 49 devices that are eligible to receive the MIUI 9 Update. Users should check if their Mi or Redmi device is in the list or not by searching below. Note: This guide is to enroll in the Chinese version of the Beta ROM. 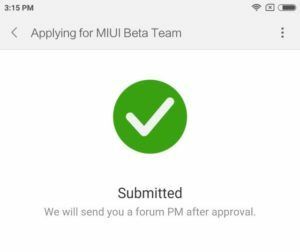 Details regarding the Global version of MIUI 9 Beta ROM are yet to be announced by Xiaomi. Step 2. Open the MIUI Forum app and Login with your MIUI account. Step 3. Go to back to the Start page of the app and tap on the “Recruitment” option. Step 4. Then on the next page, select the model of your Xiaomi device from the drop down list. 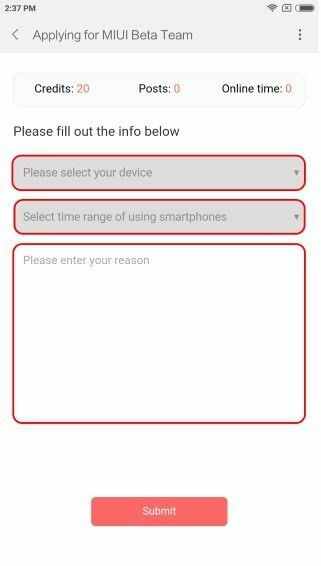 Also, select the number of years of experience you have in using the Android smartphones. Step 6. Once done with these fields, tap on the “Submit” button. You’ll be redirected to a browser window saying that your application has been successfully submitted. That’s it. 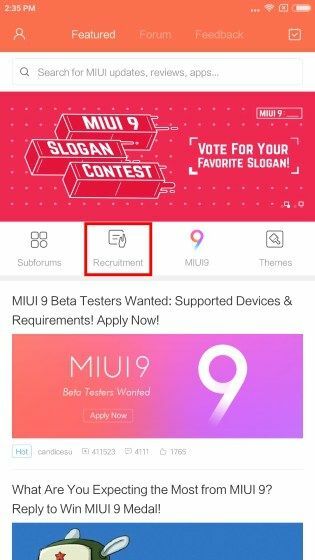 You have completed your part of registering for MIUI 9 Beta program. Now just wait for few more days, to know if your application is selected. The first batch of selected users will out on July 25, and then other batches will follow soon. Selected beta testers will be notified by an email or message. The Email or message, will also include further instructions on installation process of the MIUI 9 Beta update on your device. Good luck filling the form and we hope for your selection.